About Time vol. 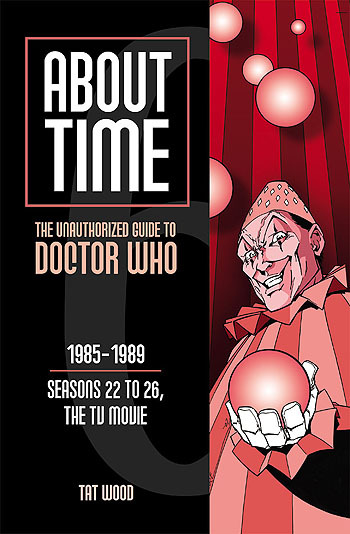 6 covers Seasons 22 to 26 of "Doctor Who," focusing on the tenures of Colin Baker and Sylvester McCoy, as well as the TV movie starring Paul McGann in mind-bending detail. In addition to the usual concerns such as the TV show’s continuity (alien races, the Doctor’s abilities, etc.) and lore (anecdotal, "Did You Know? "-style material), author Tat Wood will examine each Colin Baker, McCoy and McGann story in the context of the year/historical period it was produced, determining just how topical the stories were. Essays in this volume include: "Is Continuity a Pointless Waste of Time? ", "Why are Elements so Weird in Space? ", "Why Do Time Lords Meet in Sequence? ", "Is There a Season 6B? ", "Did They Think We'd Buy Just Any Old Crap? ", "What Might the Other Season 23 Have Been Like? ", "Who Narrates This Programme? ", "How Warped was the Doctor's Mind? ", "How 'Good' is the Doctor? ", "The Valeyard, Er - How? ", "What's All This Stuff About Anoraks? ", "What are the Oddest Romances in the Programme's History? ", "The Semiotic Thickness of What? ", "When Did Susan Go to School? ", "What are the Gayest Things in Doctor Who, "Did Cartmel Have Any Plan at All? ", "Could It Be Magic? ", "Where Does 'Canon' End? ", "What Were Josiah's Blasphemous Theories? ", "Are These 'gods' Related? ", "What About Season 27?" and "Does Paul McGann Count?"